Some just mentioned the pure facts like Ron in Bruichladdich into Talks with Remy Cointreau. Others were much more vocal: Ralfy at Whisky Stuff just had a plea, Bruichladdich, Don't Sell ! In Bruichladdich selling to Remy? John Hansell writes about his feelings on the sale and previous communication. From the non-English speaking world I can understand (i.e. 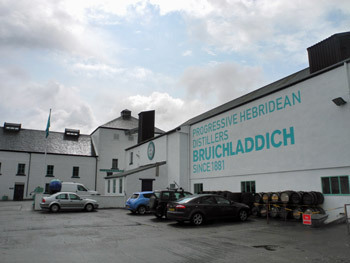 German) The Islay Whisky Chapter Austria in Bruichladdich kurz vor dem Verkauf? wonders if a large multinational will continue to support a local bottling plant helping to provide jobs for the disabled. Julia Nourney in Noch mehr französischer Einfluss auf der Insel? has concerns about Bruichladdich's independence, but also hope after the Beam/Cooley example. She also wonders how long Kilchoman will remain independent. Just a few examples of the reactions. Of course it also features on the business pages, the Scotsman in a quite detailed analysis writes French drinks giant Rémy linked to £25m move for Islay distillery. So what's my own judgement? Mixed feelings. Assuming it really happens (and I think it will, while some of it is regulatory requirement it also shows how far the discussions have progressed) I can see both advantages and risks. Having a large corporate backer I think will allow Bruichladdich to easier get projects like the envisaged reopening of Port Charlotte off the ground. Having access to a global distribution network will help it to access new markets and continue to grow, after all, let's face it, Bruichladdich like any other business needs to grow. On the other hand I think I'm not alone in being concerned the Bruichladdich style might be smothered by corporate control and blandness. While I haven't always agreed with Mark's style and we've had a few disagreements I certainly respect and admire him for his enormous passion. If he stays (which is a huge if, as he might be ‘surplus to requirements’), will he retain that freedom? A lot of reassurances are being given on Twitter and Facebook that not much will change, yet I just can't help to have these niggling doubts. Of course it's still early days, so nobody can really predict how it will all work out. I hope for the best.